I’m on a mission to eliminate what appears to be an epic waste of time, money, and resources, so I went to the source to find out what is getting in the way of trainer success. What I uncovered is shocking, widespread, and downright disabling to a trainer’s success. Here are the top five challenges trainers face at work, and how they’re addressed by ATD’s Training Certificate Program. How the Training Certificate Program Can Address This Challenge: Questions set priorities. By understanding this fundamental principle of communication, you can help time-constrained stakeholders by asking the right types of questions. The course provides two excellent resources: the Is Training the Right Solution? chart and six categories of questions for conducting an effective needs assessment. How the Training Certificate Program Can Address This Challenge: In addition to covering analysis basics, the course briefly reviews the most common types of data collection methods used in the assessment process. How the Training Certificate Program Can Address This Challenge: Attendees are taught how to write measurable learning objectives; objectives that, when achieved, align directly to and positively affect organizational goals. How the Training Certificate Program Can Address This Challenge: The huge benefit of this course lies in the social learning that occurs. Along with the facilitator, participants share their experiences and best practices for getting buy-in. Module 5 (evaluation and performance) starts with a review of the Transfer of Training matrix followed by a great discussion on evaluating training. These enable participants to develop strategies that are tailored to their specific situation and organization. How the Training Certificate Program Can Address This Challenge: The course contains a smorgasbord of tools, templates, and checklists for creating a comprehensive training ecosystem in which change can be effectively managed. 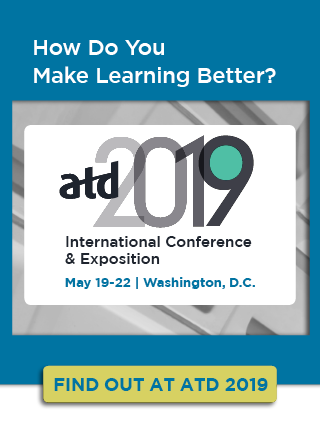 By using the tools provided in the ATD Training Certificate course, you can effectively address these challenges to enhance your training program’s value and credibility while simultaneously creating a better job experience for your most valuable asset—your training professionals.